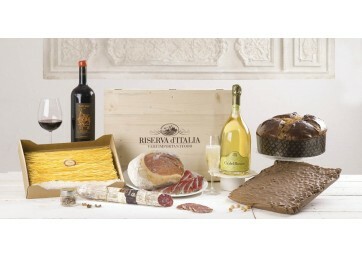 A leap into the gourmet world.Among other products, in this package are the renowned hazelnuts of Piedmont, the hazelnut cake, the ribbon of raw ham seasoned in Langhirano, accompanied by Dogliani Superiore and Prosecco Superiore wines from Valdobbiadene, both DOCG. In the richest Black selection you'll ever see there are more news: Nebbiolo Langhe Wine, tajarin at Barolo and the delicious zabajone of the starred chef Davide Palluda. A gift that leaves open! The Riserva 5 is synonymous with triumph.A triumph of national flavors and excellence that make them enchanted. There is nothing missing here ... from salad to a wide sweet choice, from appetizers for aperitifs to good drinking. A selection dedicated to your "special" customers. The accurate search for ever and unpublished products in XXI format ... to share with the family and friends all the flavor of Riserva d'Italia. Our flagship flower.A selection of renowned Italian food and wine excellence. Large Product Labels for Large Products ...From the Barolo DOCG to the Tuna Red Rye Tuna Isle of Carloforte. From Whole White Porcini Mushrooms to Barolo Grappa of gaja. A pack of real connoisseurs.